I try to tailor my lesson on each student while maintaining my lesson goal. As I was taught, lessons with students have a great deal of learning by ear. By focusing on sheet music, sometimes the real sound of the tune is lost. Learning by ear, students are more apt to focus on mimicking sounds and getting in touch with the music in the way I do. I encourage my students to listen to musicians from around the world and challenge themselves to try the melodies they hear. By really listening one becomes a better musician as whole--music is something to be shared with others not to be hoarded to oneself. My philosophy to teaching music is almost identical to the way I teach in the classroom. Not all of my students will be famous, and they may not play for the rest of their lives, but all of my students deserve the opportunity to play an instrument that makes them happy and provides a fun challenge. As I've mentioned above, I teach to the student's abilities and interests to the best of my ability. 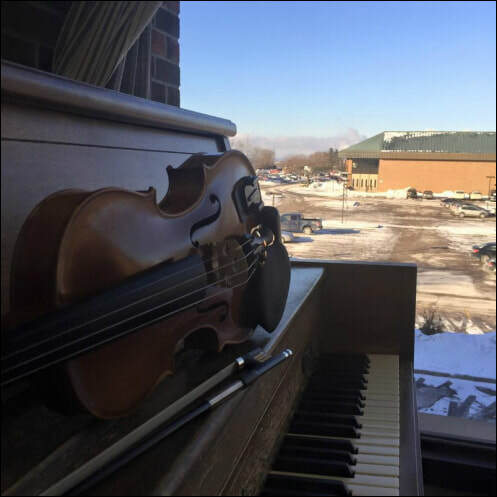 While keeping in mind that there are certain skills every fiddler must master, there are some skills or exercises that do not apply to each student. There are no auditions, there are no benchmark due dates, and practice is not enforced. My philosophy with teaching music is that it should be fun and fascinating to students of all ages and abilities. When I first learned, my teacher encouraged exploration of the instrument, "writing" my own tunes, and always coming back with a surprise. Because I know how important that was to me, as a new musician, I know that it is imperative with all students. Click here for pricing and more information about what is included with lessons.